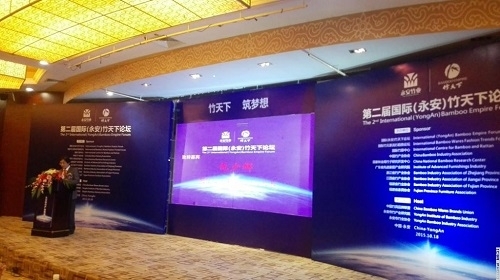 On Oct. 18th, 2015 World’s Fair for Bamboo Furniture and Household Goods, sponsored by the International Center for Bamboo and Rattan (ICBR), China Bamboo Industry Association, Fujian Furniture Association and the Institute of Advanced Furnishings Industry, and hosted by Yong’an Bamboo Empire Co., Ltd., Yong’an Institute of Bamboo Industry and Yong’an Bamboo Industry Association, was held in Yong’an, Fujian Province. This year’s event witnessed the unveiling ceremony of Yong’an Demonstration Park for Bamboo Science and Technology, the 2nd International (Yong’an) Bamboo Empire Forum, the signing of the cooperation agreement of the Bamboo Industry Big Data Center, the awarding ceremony of the 4th International (Yong’an) Bamboo Product Design Competition, the annual conference of the China Bamboo Ware Brand Union, and the launch of several bamboo-related projects. More than 700 representatives, including experts from colleges and universities, bamboo artists, designers, manufacturers, distributors and purchasing agents of bamboo furniture, and members of business unions attended the fair. Mr. Du Jishan, Deputy Director General of the Department of Science and Technology of the State Forestry Administration, was present at the opening ceremony of this year’s fair and unveiled Yong’an Demonstration Park for Bamboo Science and Technology. Prof. Fan Shaohui, Director of ICBR’s Science and Technology Division, addressed the fair’s opening ceremony and the Bamboo Empire Forum on behalf of the host, and presented awards on the Bamboo Product Design Competition. The fair was a showcase for the world’s top-notch bamboo products, representing the best of China’s bamboo industry in all its dimensions. It is bound to facilitate the trade of bamboo products, inspire the R&D of bamboo lumber, promote the manufacturing of bamboo products, and further develop the bamboo culture and bamboo-related tourism.